A beautiful set for a little princess. Do crochet sandals and a headband. This is a great free pattern for every mother. I have white sandals with a red rose motif for you. 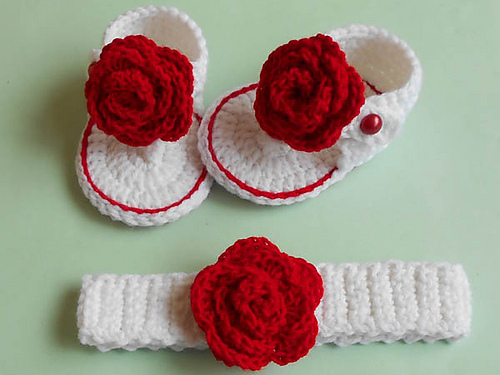 They are for children from 0-3 months. Every mother loves beautiful things for her children. This pattern conquers the hearts of everyone. The pattern is made of double knit 100% acrylic. It is a quick and simple pattern for crocheting. Dress your child in beautiful clothes. They are the best sandals for summer and elegant occasions. They are just cute! 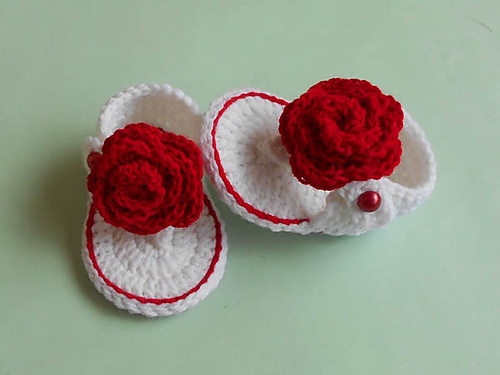 Baby Flip Flops Rose Sandal Free Crochet Pattern is here.